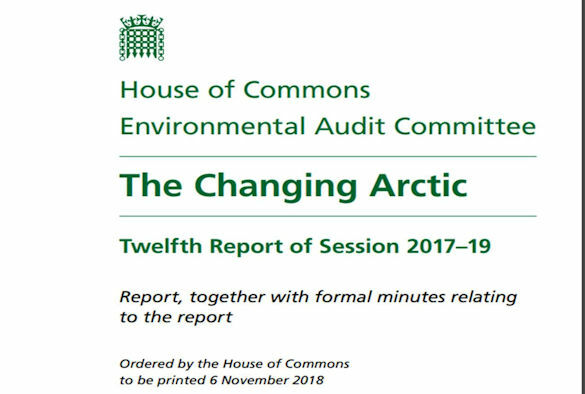 Written evidence provided by University Lecturer in Glaciology, Dr James Lea, features in a new report about the UK’s role in the Arctic published by the House of Commons Environmental Audit Committee. ‘The Changing Arctic’ report is the result of an eight-month inquiry examining the rapid changes in the Arctic environment and the Government’s approach to Arctic research and policy. Dr Lea’s submitted written evidence to the Committee drawing on his research expertise on iceberg producing glaciers, also known as tidewater glaciers. In his evidence, he highlighted the future potential risks to shipping and infrastructure (for example, ports and oil and gas rigs) from icebergs as sea ice decreases and how this could impact on the viability of future shipping lanes through the Northwest Passage and Northern (east) Sea Routes. Dr Lea’s evidence also emphasised how these glaciers have potential to rapidly contribute to future sea level rise, and the difficulty in predicting exactly how they will respond to future climate change. The full report draws on evidence from a range of academic experts, charities and businesses, and is available to read here. Dr Lea’s evidence can be found in section 130 on p.44 and 45. The report concludes that the UK Government should reconsider its encouragement to UK businesses to explore oil and gas opportunities in the Arctic. It also calls for increased funding for scientific research into the situation in the Arctic.